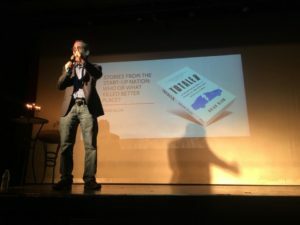 Back from a highly successful U.S. speaking tour, TOTALED author Brian Blum will share the lessons learned from the Better Place story this week in Tel Aviv at a special English-language version of the popular “Fuckup Nights” event. FUN is a global movement that started in Mexico in 2012 to share publicly business failure stories. Hundreds of people attend each event to hear three to four entrepreneurs share their failures. Each speaker is given 7 minutes and is able to use 10 images. After each speaker, there’s a question/answer session, as well as time for networking. FUN sells out quick – there are no tickets left for this Tuesday, but there is a waiting list, so you’re in town, sign up just in case – and is guaranteed to be a lively night. How could it not be with a room full of 200 Israelis asking questions! UPDATE: the video from FUN is now available. Visit the FUN Facebook page to watch the archived live stream. UPDATE 2: an edited version of the FUN talk is now on YouTube. You can watch it below.